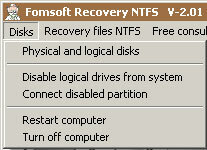 Fomsoft Recovery NTFS V-2.02, Menu - Disk Management and your computer. Menu - Disk Management and your computer. 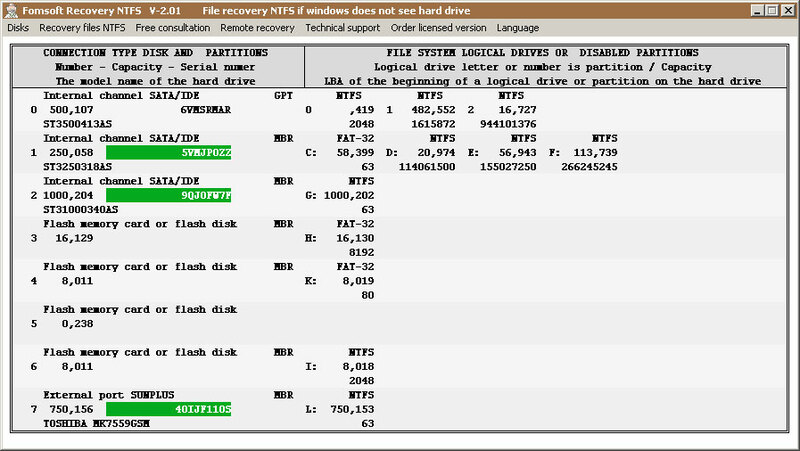 Figure 2 shows the content of the program menu Fomsoft Recovery NTFS - disk management and computer - [Disc] . Рис. 2. Menu - Disk Management and your computer. 1 The physical and logical drives. 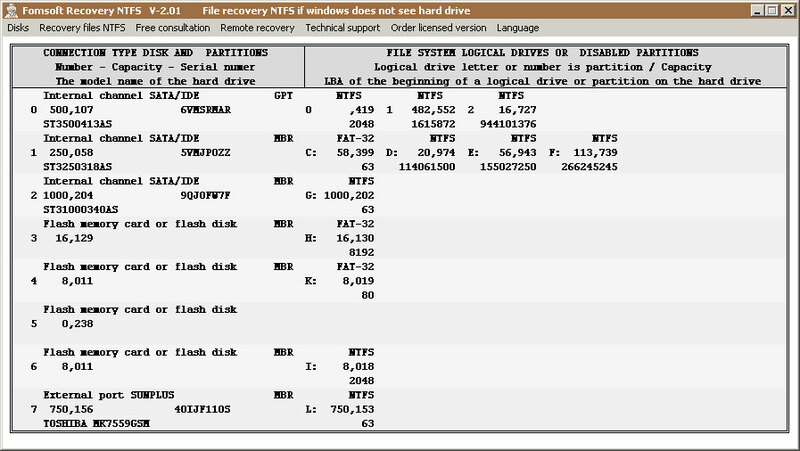 Displays the list of physical disks, and placed them on the logical drives, as well as disabled from the Windows operating system partitions. so that the hard disk for the Windows operating system becomes busy a foreign file system, and she ignores it. 3 Connect disconnected partition. 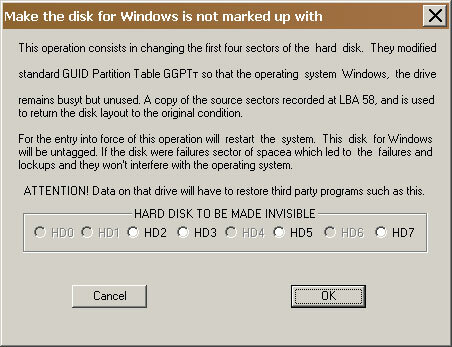 The program restores the original value of the first four hard disk sectors, which posted MBR disk partitioning table and GPT, from a previously saved copies at LBA 58. 4 Restart the computer. is rebooting the operating system. 5 Turn Off Computer. Turns off the computer power supply. markup type identifier MBR or GPT. The unique serial number of hard disk. The licensed version for licensed disks, this field is displayed in green. License ID for the hard disk drive If licensed, the ID is displayed in green. The third line contains the name of the hard drive models, both internal and external, is connected via USB. LBA start partition on a physical disk (hard drive). Рис. 3a. Free version, information about the physical and logical drives connected to the computer. Рис. 3b. Licensed version, information about the physical and logical drives connected to the computer. Disable logical drives on the system. This operation is to change the first four hard disk sectors, which contains information about MBR and GPT partition. They are modified by the standard GUID Partition Table (GPT) so that the Windows disk becomes engaged in a foreign file system and the Windows operating system will not offer its format and to scan to eliminate possible problems with the integrity of file structures. A copy of these four sectors recorded at LBA 58, and is used to bring the disk layout to its original state. For these changes to take effect, you need to reboot the system. After rebooting, this disk for Windows will be untagged, but busy. If it were a hard disk failures sector space, leading to crashes and hangs, then they will stop further hinder loading and operating system functioning. Рис. 4. Note drive to disable it from the Windows operating system. This function restores the original content of the first four sectors on the hard disk from a previously saved copy. After this operation requires a reboot of the system, Only after this operation will be the drive for Windows markup as before. If the present disk failures sector space, they again lead to various problems and even hang Windows at system boot. WARNING! When you restart the operating system can run a file system integrity check on the disk. 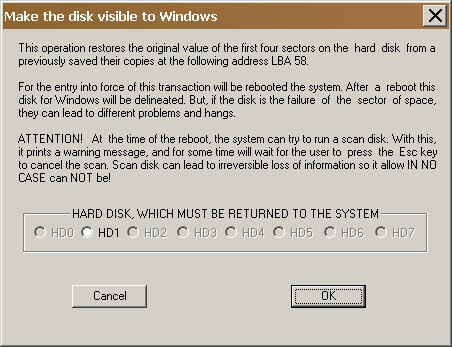 At the same time it issues a warning, and while awaiting the user's command to cancel the operation. For some time the system waits for pressing the Esc key, if the user it does not, then the system launch the file system integrity checking, and will "heal" the file system, removing the conflict for her files. Some of these files are critical to get the user's files. Рис. 5. Select the hard drive to disconnect it from the operating system. Reload / turn off the computer. These features in particular the comments do not need, it may be noted that the speed of their performance is higher than similar operations, performed by the system menu [Start] Windows operating system. Laboratory Fomsoft - Service remote data recovery and photos with his own hands. Date of last adjustment - 02.04.2017.